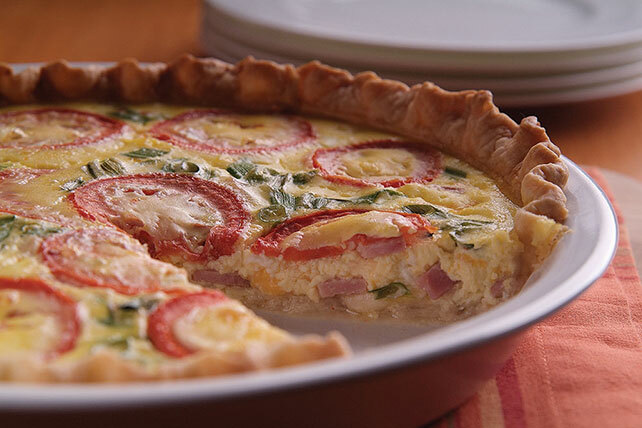 Enjoy bits of Canadian bacon, Swiss cheese and Roma tomatoes in this quiche. Our Canadian Bacon Quiche will be a multi-national favorite in your house. Preheat oven to 400°F. Prepare pie crust as directed on pkg. for unfilled 1-crust pie, using 9-inch pie plate sprayed with cooking spray. Arrange Swiss cheese pieces evenly on bottom of pie crust; top with the Canadian bacon. Beat eggs and milk with wire whisk until well blended; pour into crust. Sprinkle with onions and shredded cheese; top with tomato slices. Bake 15 min. Reduce heat to 350°F; continue baking 25 to 30 min. or until center is set and top is lightly browned. Let stand 10 min. before cutting into 6 wedges to serve. Prepare as directed, omitting the milk, substituting 1 cup cholesterol-free egg product for the eggs and using 1/2 cup KRAFT 2% Milk Shredded Reduced Fat Sharp Cheddar Cheese. Cover and refrigerate any leftover quiche. To reheat, place 1 serving on microwaveable plate; cover loosely with microwave-safe paper towel. Microwave on MEDIUM (50%) 1-1/2 to 2 min. or until warmed.